Ask me how much I'd be willing to pay for a Juddmonte mare--any Juddmonte mare--and I wouldn't hesitate to close out my 401k and give you the PIN to my debit card. And I'd still be getting the better end of the deal by far. Pretty much, if she comes from Juddmonte's broodmare band, she's one of the finest mares in the world. Juddmonte has generations of investment in building truly royal Thoroughbred female families. Because the program is focused on producing top running stock--instead of commercially attractive yearlings--the quality of Juddmonte's families has been strengthened with each generation. When Saudi Arabian Prince Khalid Abdullah's outfit deems a broodmare a cull, you can bet she'll become the top mare in her new owner's barn. Juddmonte gave every opportunity to homebred Gombeen. She was trained by Hall of Fame conditioner Bobby Frankel and ridden by top jocks Corey Nakatani, Mark Guidry, Robby Albarado, and Eibar Coa. Despite all this, she showed little on the track (though, to be fair to those connections, she did place in four of five MSW starts at 3). Race record: 8 starts, 0 wins, 3 seconds, 2 thirds. Earned $26,026. Produce record: dam of 9 foals, 8 of racing age, 4 raced, 1 winner. Covering sire: Covered by Latent Heat and First Defence. As a broodmare, Gombeen visited excellent represenatives of the Mr. Prospector sire line (Distant View) ... the Northern Dancer line (Storm Cat, Storm Boot, Belong to Me, Boundary) ... the A.P. Indy line (Aptitude) ... and even the Caro line (Mizzen Mast). Results to date: eight foals of racing age and a single, not especially impressive, winner. Clearly, Gombeen has failed to live up to her family legacy. She is a half sister to 13 other foals out of the blue hen Razyana, seven of which are black type horses. Razyana is one of the best mares to represent the line of Natalma (dam of Northern Dancer) and Almahmoud (granddam of Halo). If any American family has perpetuated class from one generation to the next, it has been Thoroughbred family 2-d. So how often do daughters of Razyana come on the market? As you should suspect, they don't. The only other Razyana daughter to be sold at public auction was her 1987 El Gran Senor mare, Emerald--and only then at age 22 and having produced no black type from 13 foals. As a 22-year-old barren mare, Emerald sold for AUS$9,000 (about $14,000) as 2009 Inglis Easter hip 111. How's that for a comment on the value of Razyana's progeny! The sales team at Keeneland must have struggled with how to place Gombeen in the seven-book November sale. 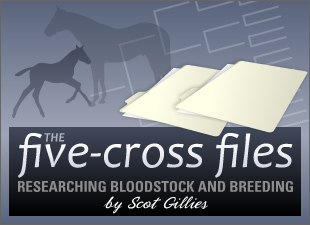 Here's a mare who could bring six figures just based on her impossible-to-obtain bloodlines. Half sister to Danehill! Never before offered! Book 2 must have been tempting, even given her age. But would it be fair to place a non-winning, poor-producing, 15-year-old mare in an early book? Probably not. Was Book 6 too late for Gombeen to be viewed by the "right" audience? Possibly, but I suspect anyone who really wants this bloodline will stick around. I'm going to predict that Gombeen is one of the two or three sales toppers in Session 10. Last year, the top five horses sold for $47,000 through $67,000, with a $9,431 average and $6,000 median for the full day. I'll go out on the line and predict Gombeen at a minimum $50,000.